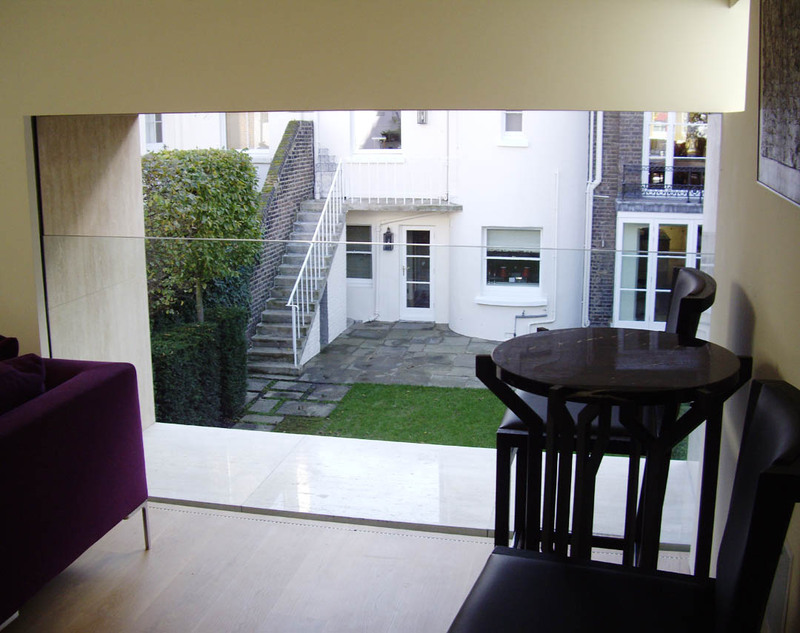 This frameless glass balustrade forms a ‘picture window’ into the garden outside, and, in approximately 20 seconds, descends into a void below to open the room to the exterior. It stops at a pre-set height to serve as a balustrade due to the height of the room above ground level. If it had been mounted at ground level, the design concept would allow the glass to descend until fully retracted. After detailed architectural negotiation with local authority building control, the room insulation was increased to such an extent that the sliding glass wall was not required to be double glazed, which in turn allowed the top edge to be simply polished glass, not cluttered with all the normal framing associated with double glazing and non-structural glass. Such frameless design not only looks elegant, but also allows a maximum amount of light to flood into the room. The gaps between the glass and all the various finishes are kept as small as possible, and yet contain seals that stop water ingress and prevent scratching of the glass as the wall moves. To accentuate the blurring of inside and outside, the junction of the two zones is very flush and separated only by the glass. Such detailing means that the edges have to seal, but also allow persistent water to drain internally via a series of mobile internal water ducts that re-direct this water back outside. The horizontal lower edge in particular has to accommodate all the windblown water against the glass, and on the outer marble return. The automation has an emergency manual release to be used in case of power or system failure; this will close the glass wall as required. The single slab of glass weighs around 280kgs and was installed from beneath via the garage access.